Minden standard bearers for the Observation Corps. Yesterday I made my own flags for the 3rd Regiment of the Russian Observation Corps Musketeers using the flag images that are available on the Kronoskaf web site. If you are unfamiliar with Kronoskaf and you have an interest in the Seven Years War, then you owe it to yourself to click on the link below and visit the site. The link takes you to the home page of the site. Click on the link called "Armies" and then select from the list of countries that are available for articles. In this case, click on "Russia" which will take you to the page of articles on the Russian army of the SYW. There is a list of combat arms such as cavalry, artillery and ordanance, infantry (with subcategories for musketeers, grenadiers, Observation Corps, light troops, etc.). 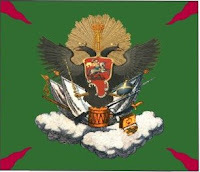 Regimental flag of the 3rd Regiment Observation Corps Musketeers. I have had some success taking the basic flag image, creating a two-sided flag, and then embellishing the flag with hand-painting the emblems and designs on the flag. The end result is a hand-painted flag that looks very nice. I have posted the original Kronoskaf flags on this thread so that you can compare them to the ones that I hand-painted. Reverse side of the Observation Corps colours. click on the flag image and download the image to your computer. I use an Apple system so my procedures apply to the Apple world, but I would imagine that Windows based systems use similar procedures. click on the image and using your cursor, outline the flag but cut off the flag pole and finial part of the image. click on the Tools drop down menu and select "crop". save the edited image under a new file name. Open up a new Word document and insert the new flag image in the document. click on the flag image - there will be a sort of arrow in each corner of the flag, use your cursor to click on one of these and use to resize the flag to a serviceable size. I find that 1.5" square or slightly larger is a good size for each side of the flag. once you have sized the flag, then click on the flag agains and select "Copy" from the Edit drop down menu. clikc your cursor next to the flag image in your Word document and select "Paste". You will now have both sides of the flag next to each other, creating a two-sided flag. Once the flag is printed, then cut out the flag and double check to make sure that the size of the flag fits with your miniature standard bearer figure. glue the flag to the flag pole with white glue (I use the "Elmers" brand of school glue). I spread the glue across the paper using a tool called a "clay shaper" which you can buy at a craft store such as Michael's or Joanna Fabrics. It has a paint brush style handle with a synthetic rubber tip - use one of the tools that has a flat edge. Using this tool, you don't have the problem of glue drying on a paint brush after you are finished using it because the glue wipes right off with a piece of tissue or even your finger tipe. press the halves of the flag together and use a small paint brush handle or a pencil to shape furls into the flag. Note that flags tend to flap and furl on the downward diagonal axis away from the flag pole. Many gamers tend to use a furl that is parallel to the staff. Don't do this - it is unrealistic and does not look as good as a flag that is furled on the diagonal axis. Now you are ready to paint the surface of nearly the entire flag image. start with the "field" of the flag and paint the surface with an acrylic paint color that is similar to the color on the printed image. In the case of my Observation Corps flags, I used a P3 brand green paint called "Knarls Green" as my basic shade color. Paint all green areas green, but leave a very slight amount of green near the flag emblems unpainted and let the original color show through. Later in the process I will add highlights to the colors on the flags. All of the cloud designs on the flag are painted over with a light grey paint (IWM brand "Light Grey" or a similar craft paint was used on my flag). The black double headed eagle is next. I take some basic black paint and mix in some white paint until I get a dark grey/light black color. I paint strokes of the dark grey on the feathers to add a dimension/depth to the eagle. Later, I will go back and mix up a slightly lighter version of the dark grey and paint some highlight strokes on the wings to really make them "pop" and get noticed. Red areas are painted with a Reaper brand "Blood Red" color and then highlighter with Reaper "Bright Red". If you want even more depth to the red, add a second highlight (your third variety of red) of "Fire Red" Reaper paint to the red bits. Now to the gold sunburst image that is behind the eagle. I paint the whole sunburst P3 "Rucksack Tan" as the base shade color. Next I paint strokes of P3 "Mouldy Ochre" color to highlight the basic rays of the sunburst. Finally, I mix some white paint into the Mouldy Ochre paint to create a highlight color and carefully add strokes of this color over the Rucksack Tan strokes. Be sure to leave some of the shade color on the edges of the highlight brush strokes. I wasn't entirely satisfied with the highlighting of the yellow bits, so I took some Reaper Master Series "Candlelight Yellow - 09408" and put dabs of this color on the tips of the sunburst rays. Next I outline the yellow bits on the edges of the central emblem of the flag. I think that it is St. George, but I'm not sure and it doesn't really matter. The lines are so tiny that I only used the P3 Mouldy Ochre paint color and did not bother with shades or highlights for the lines. There are some white bits on St. George so I dabbed some white paint on these but tried not to touch up the tiny St. George image too much because sometimes too much is "too much" in appearance. Now I work on the flames that are in each corner of the flag. These are red on the regimental flag. I paint the whole flame Reaper Blood Red and then add the Bright Red and Fire Red highlights to the flames. Time to paint highlights onto the green field of the flag, using Reaper "Leaf Green" color, paint brushstrokes of the colors on every bit of the flag that is where you would expect to see lighter colors such as the top part of the furl. The recessed portions of the furl are left untouched (i.e. in Gnarls Green). Now if you are really confident in your highlighting skills, then add some white paint to the Leaf Green paint color to create an even lighter highlight and add a few brushstrokes of this mix to the raised areas of the flag which you have already painted Leaf Green. Use this second highlight color sparingly. That completes the repainting of the regimental flag for the 3rd Regiment of Observation Corps Musketeers. The colonel's white color is done in a similar manner on the emblems and designs of the flag. For the field, I often leave the field in the white color from the printed image, but add a few brushstrokes of light grey here and there to some of the folds and creases of the flag where you would expect to shade the white. Use the grey sparingly. I few lines are all that you need. Again, too much will overwhelm the visual impact. As you can see from the images of my painted flags, you have basically hand-painted your own flag. All that you have done is paint over the printed image with your own acrylic paint. The effort takes about 1 to 2 hours per flag, but I think that it is well worth the time spent. I posted pictures of the Observation Corps Grenadiers, that I painted and based on my blog the other day, and I have to say that I'm a bit perplexed. I have a general idea of the number of visits that the average blog posting will generate, but for some reason, the OC Grenadier post barely generated any look sees. Either people are getting tired of all of my Russian blog posts, or else this particular one fell under the radar screen. 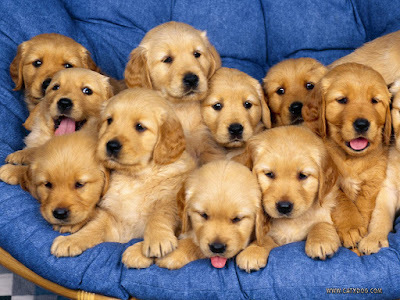 Hence the "Free Puppies" post heading today - I wanted to see if anyone was out there. Well, I'm not going to stop posting pictures of my Russians, 'cuz that's what you do when you are in the miniatures business and are marketing one of your new products. Also, they are a key element of my Kunersdorf Project for 2019 so I'm afraid that I will be given the Russian army some love over the coming months. With the long Memorial Day weekend upon us, I suspect that web traffic might be down a little bit as most people get together with family and friends rather than spending all their day on the internet. On the other hand, maybe readers want to get away from it all for a few moments, so I will be actively blogging over the holiday. 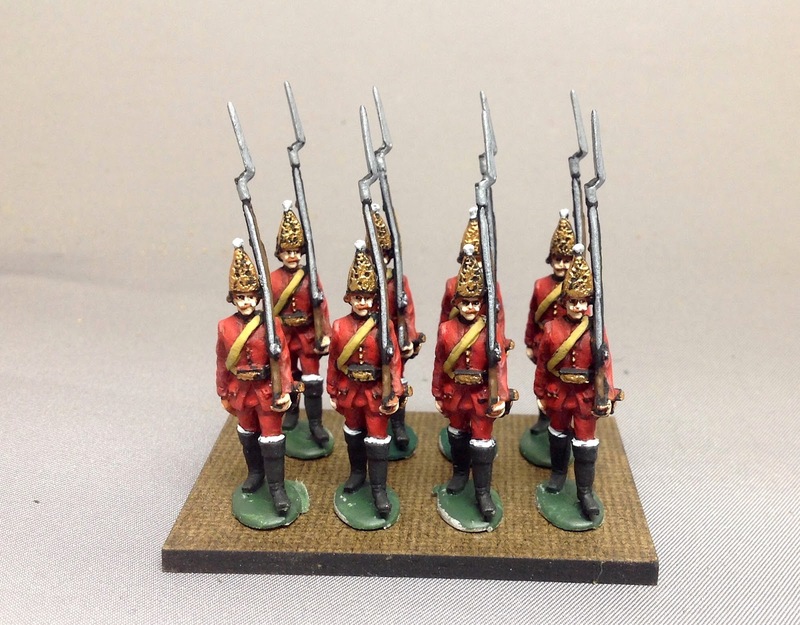 Something as equally adorable are the new Minden Observation Corps musketeers that I finished painting the other day. I ran out of wood MDF bases, so I can't base and flag the unit until I visit my FLGS and purchase some more. Minden SYW Russian Observation Corps Musketeers. Click pix to enlarge. A better view of the full battalion. I have to say that the Russian infantry in summer waistcoats are the easiest to paint figures that I have ever worked with. Everything on them is either red or black and there is a minimal amount of equipment that one needs to paint, because these guys are traveling in light gear on a hot summer day. Aside from my having a Kunersdorf and Pomeranian Army projects, why Russians, you might ask. 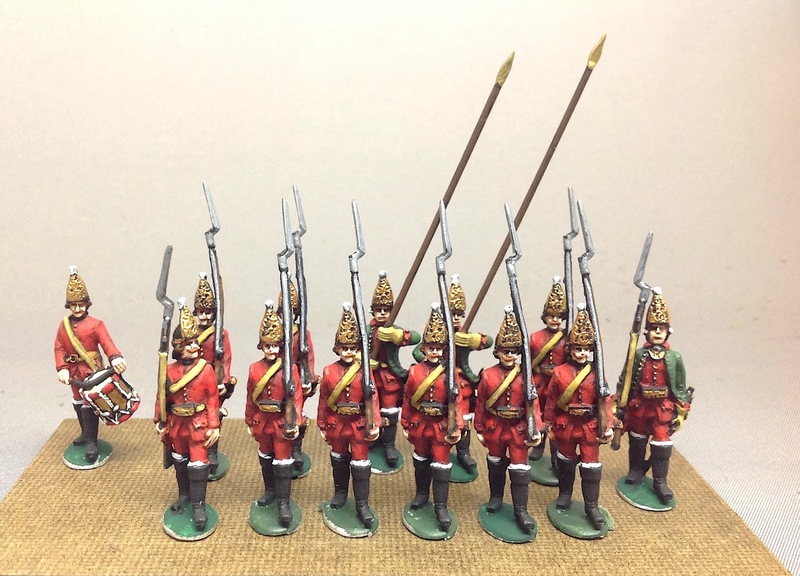 For starters, I like the color combinations of the green/red regulation uniforms because they look nice and they are a change of pace from painting dull white coated Austrians or French, or dare I say, even painting battalion after battalion of Prussians. Heresy, I know, but I like to branch out a little bit on my painting table. Second, the Russians were the toughest foe, bar none, that Frederick the Great had to deal with during the Seven Years War. In fact, Frederick never defeated a Russian army nor did any of his subordinants in other battles. Even a rabid Prussophile like me will have to admit that Zorndorf was at best a draw than it was a Prussian victory. I can't put Zorndorf in the win column for Fritz. It was a battle that Frederick did not have to fight, because he could have achieved the same objective of evicting the Russians from Prussian territory simply by maneuvering across the Russian line of supply. This he had achieved when he crossed to the east bank of the Oder River and then marched behind the Russian army, stationed at Zorndorf. Third, the Russians have an interesting variety of troop in addition to the conventional infantry/cavalry/artillery that every SYW combatant has: exotic Cossacks and Kalmucks, Observation Corps infantry wearing those rediculous cavalry boots, Horse Grenadiers wearing mitre hats, and more varieties of artillery equipment than you can shake a stick at. Fourth, the Russian military command were quick learners when it came to developing tactics that could stop or neutralize Frederick's oblique order tactics. To my way of thinking, if you are interested in refighting the battles of Frederick the Great then you need to cross swords with the Russians in your table top battles. I fought and concluded the next battle in my South Carolina Campaign yesterday, the contest between Cornwallis and Gates at Kingston, South Carolina. I will post a lot, and I mean lots, of pictures over the weekend, so stay tuned to this blog. 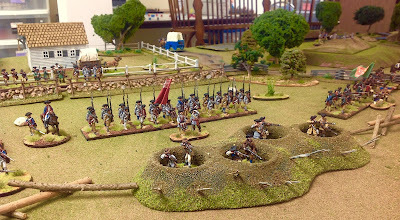 dug to slow down the inevitable British assualt on Gates' Continental army. The battle of Kingston may well have decided the outcome of my South Carolina Campaign series of games. 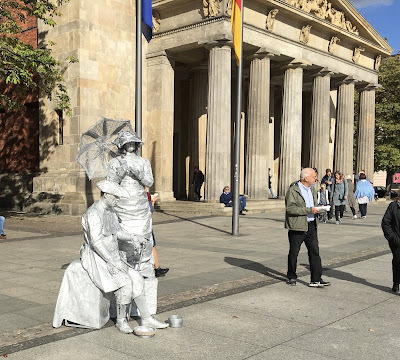 Some imagination still exists on Unter den Linden in Berlin. I was reading a post on the Independent Wargames Group about the "death" of a number of wargaming blogs in recent years. It made me think of the long roster of Imaginations Blogs that are listed on the Emperor versus Elector blog, which provides live news feed lists of updated blogs. I'd noticed this same phenomenon awhile ago but hadn't thought to blog about it. So Robbie Rodis's comments got me to thinking about it again. Dead blogs or just casualties of a different kind? I think that the total number of Imaginations listed on EvE comes to 103 blogs of which 38 are somewhat current with recent posts of one year or less. There are some other Imaginations that are listed in the Other Blogs of Interest section, such as The Grand Duchy of Stollen, to name one, that should have been placed in the Imaginations category. So I'm going to adjust that number to 104 Blogs in the Imaginations Category. In my mind, if you haven't posted on your blog in over 2 years then you are Inactive. If you haven't posted a blog entry in over 5 years then you probably have a dead blog. Where oh where did all of those Imaginations blogs go? So what happened? Well if we go back ten years from now we arrive at 2007 which was probably the high water mark of the Old School Wargaming and Imaginations fad. 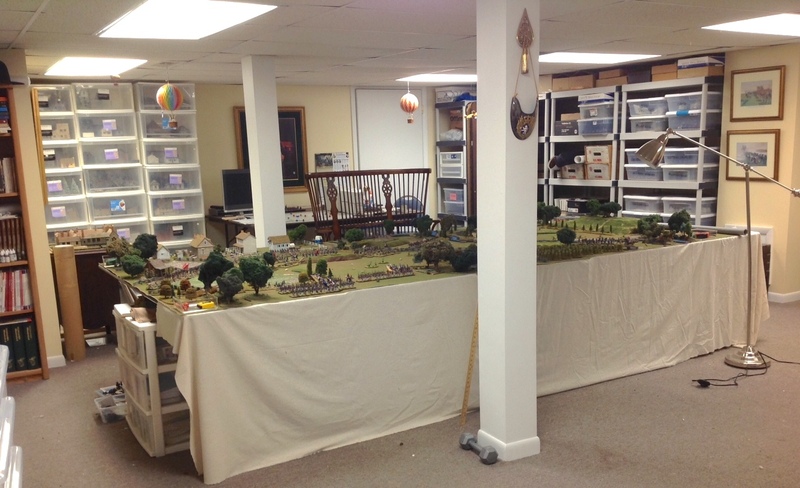 I believe that the term "Imaginations " was originated on the Old School Wargaming yahoo group that was started by Patrick Lewis. That group itself is on life support these days as most of the more active posters in that group sheared away into their own Blogs/endeavors or simply lost interest in OSW. Now a number of the group members have gone on to be regular writers of their own Blogs . Also, other forums have drawn a good following of people who might have been regular visitors to the OSW group. Part of me wants to say that interest in Imaginations waned once the central storehouse of ideas fizzled out on the OSW Group. For others, Imaginations were a moth attracted to the bright light and once the flame of enthusiasm began to flicker, so too did interest in writing blog entries. Probably the biggest reason for blog flame out is that interest in blogging on a regular basis simply diminishes. It can take a lot of effort to sustain the blog with creative writing and content. Family and Life Events take precedence over the Wargaming hobby so it is only natural that a large number of Blogs go inactive. I suppose that blogs are kind of like restaurants in that most will fail fail in the first year or two due to lack of interest. For a few years now I have been collecting busts and statues of Napoleon. I have 15 of them that I have acquired over the years and it is fun to watch the collection grow. The thing about collections is that the more of the items that you have, the better the collection will look if it displayed together. In this case, I display all of them in my library room. 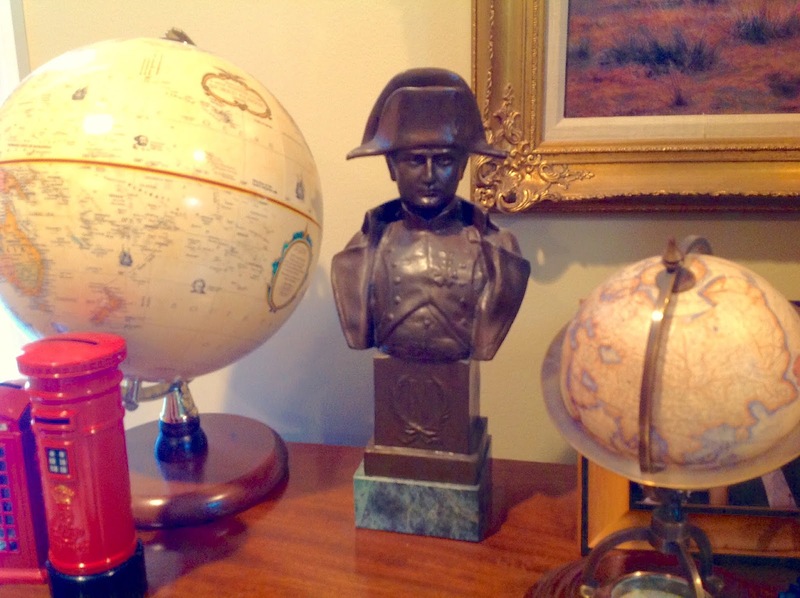 I do not include wargaming Napoleon figures in the collection and have largely excluded toy soldier Napoleona, with a couple of exceptions. 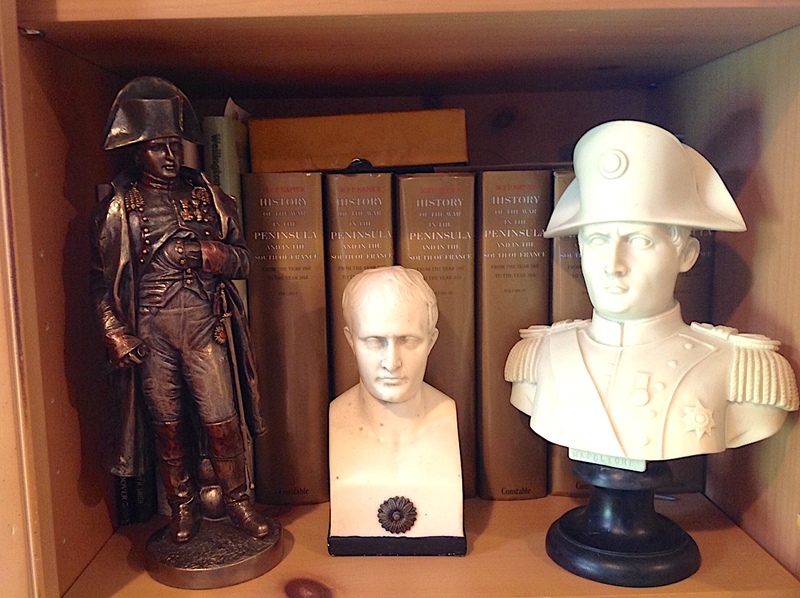 Probably my favorite Napoleon is the bobble head le petit tondu. I am always on the look out for more Napoleons. You never know where and when they will turn up. 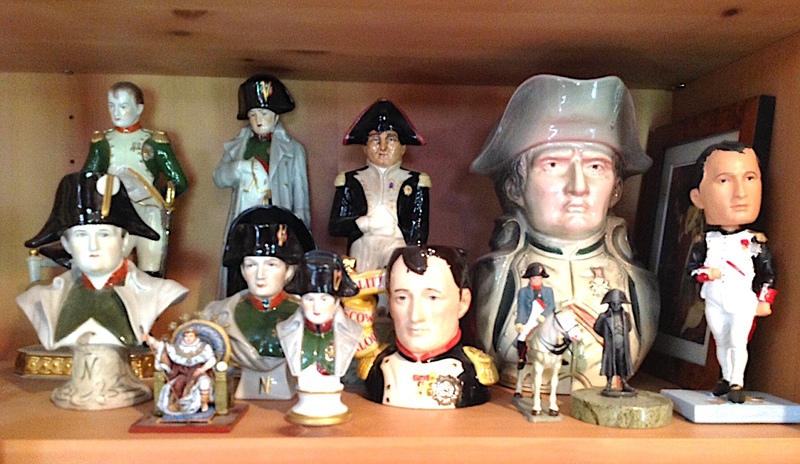 I also have a similar collection of Frederick the Great pieces that I will show on this blog in another post one day. 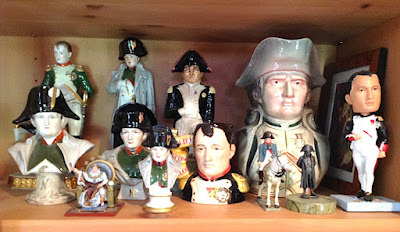 Most of the Fritz figures were acquired on trips to Germany - a vist to the book store at Sans Souci in Potsdam is a treasure trove of Fredericks. 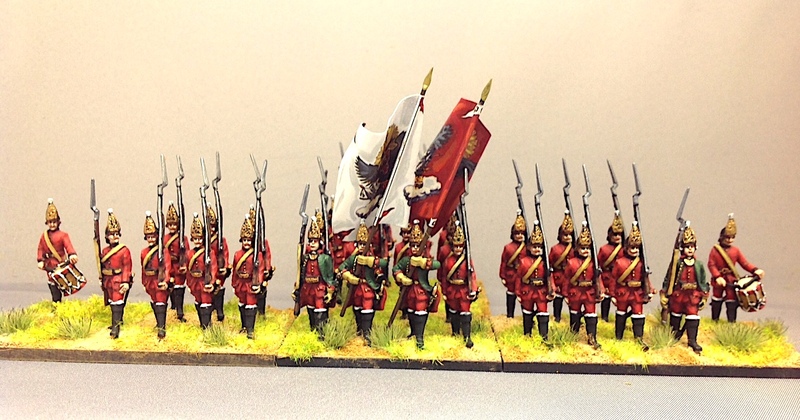 The new Minden Russian Observation Corps Grenadiers. My first battalion of Russian Observation Corps grenadiers is completed and I am really impressed with how they turned out. Kudos to Steve Barber for sculpting some gorgeous models in his first go at sculpting in the Minden style. I'm going to let Steve work on the Russian horse grenadiers next, in both regulation uniform and Summer waistcoats. 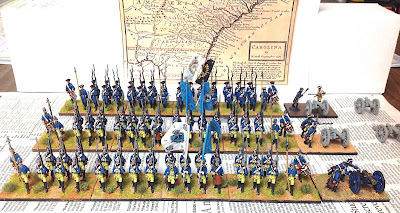 Click on the link to the Fife and Drum web store if you are interested in purchasing Russians for your own armies. The first picture above shows only three stands with 24 total figures. This was done in order to fit enough figures into the photo shot while still being able to see the close up details. The second photo below, depicts my now-standard 32-figure battalion. A battalion gun with two crewmen will be added to visually balance the appearance of the line. he battalion gun still needs to be added to the grouop. The Observation Corps grenadier flags are from the Kronoskaf site, as detailed in my previous blog post. They were embellished with some hand painting of the details by me. In one of my earlier blog posts, I mentioned that after years and years of trying to figure out how to represent battalion guns and to use them in a game, I came up with a workable system. The battalion gun will operate as a regular cannon that uses the artillery tables in my Der Alte Fritz rules. This will only apply to "long range" firing. 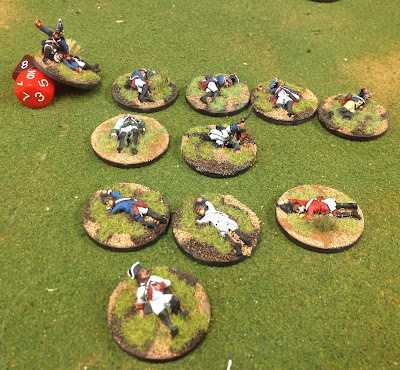 Once the battalion moves within musket range, the cannon ceases to use the artillery tables and instead, simply adds one more D10 die to the musket firing. My rules give each battalion 1 x D10 for every four figures that are firing. 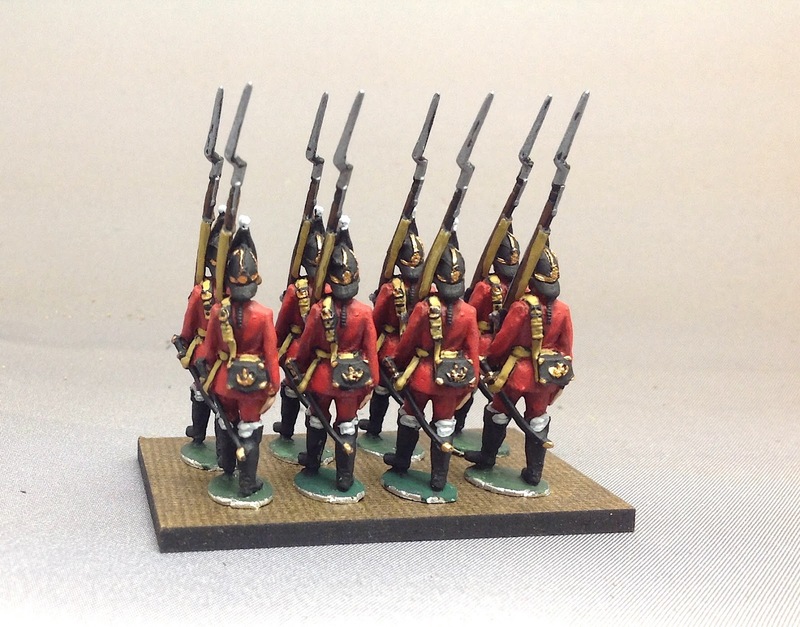 So for example, if the grenadier battalion had 24 figures left from its original 32-figure strength, then it would get 6 x D10 for musketry. However, it would also gain an extra D10 for having the battalion gun. Once the battalion loses a whole stand of 8 figures, then the battalion cannon will be removed from the table for the remainder of the game. I like that the battalion gun adds a sense of symetry to my 4 stands of 8 figures. This arrangement makes it difficult to place the colours in the center of the battalion, but adding the extra stand for the battalion gun moves the colours to the center of the battalion. Fritz likes symetry! The next unit in my painting queue is a battalion of the Observation Corps musketeers. I am back to painting Russians for these two units so that people can see what a battalion of the figures look like once they are painted. After the musketeers are painted, then it is back to painting Prussians for my Pomeranian Army. Schloss Fritz Game Room. 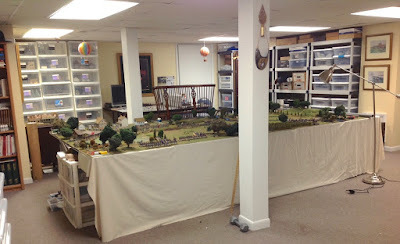 An AWI battle is set up on the 6ft x 12ft game table. Yesterday I finished the first battalion of the new Minden Observation Corps Grenadiers and so I had nothing to paint today, even though I had a lot of free time. Ouch! So I decided to go down into the man cave and tinker around with basing already-painted units and getting new ones ready for the primer spray booth. So there was no figure painting today, but catching up on some of the behind the scenes things that I needed to do in order to get my castings turned into painted figures ready for their first tabletop battle. So in effect, I was the quartermaster today working on uniforms, supplies and other logistics for my little metal men. 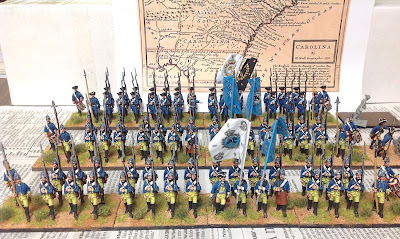 I based the Russian Observation Corps grenadier battalion and several Prussian 3-pound battalion guns, then I glued castings to cardboard in preparation for priming and painting, and made some custom flags using the Kronoskaf flags as a template. Since I have nothing to paint, it was time to get a new regiment ready for the paint table. So this afternoon I picked out 32 of the new Minden SYW Russian Observation Corps Musketeers and glued each figure onto a piece of card using white glue (Elmer's or PVA). Having already painted the OC grenadiers, I want to have a battalion of musketeers for gaming and for marketing purposes. 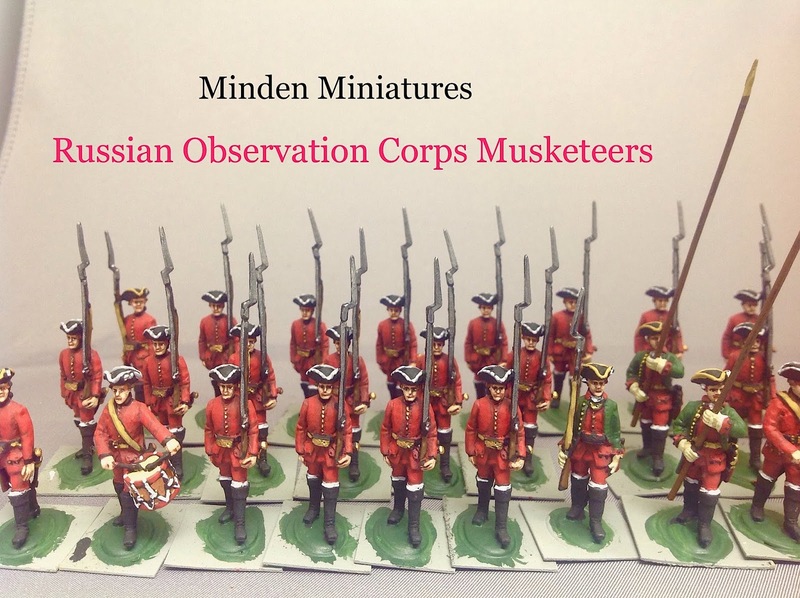 In case you missed the news, Minden Miniatures recently added SYW Russian Observation Corps grenadiers and musketeers. Minden Observation Corps Musketeers line up for their new uniforms. 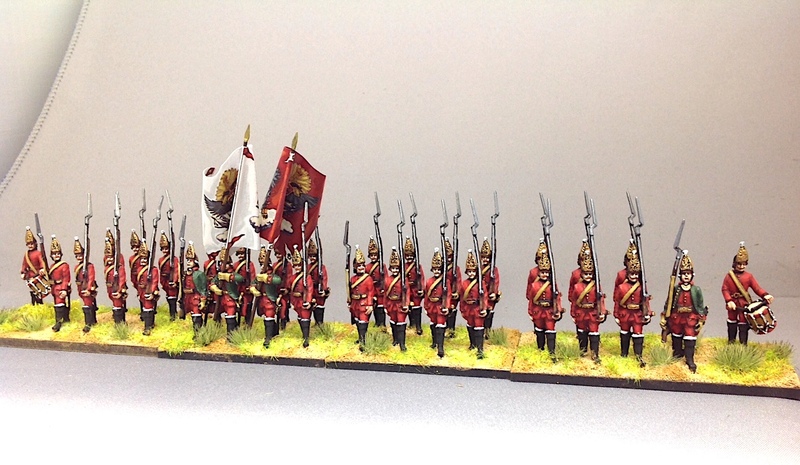 GMB Designs is my go-to supplier of flags for my SYW armies, but alas, they do not make the flags for the Russian Observation Corps troops. So the next best thing was to go to the Kronoskaf web site for SYW information and copy/download a set of OC Grenadier flags. So the process is to click on the flag image and select "download" if you have an iMac computer (I don't know how the Windows PC system does this function, but it is probably similar. The next step is to open the downloaded image in Preview, which allows you to futz around with the image a little bit (light exposure, color etc.). Then save the image to one of your files. Next, open up a new Word document and insert the flag image into Word. Click on the flag image and a sort of square appears around the outer perimeter of the image. Move your cursor to the corner of the image and start pushing inwards to change the size (height and width) of the flag image. Once this is done, then click on the Edit pull-down menu and select "Copy". Finally, move your cursor next to the flag image and click to complete the copy-move function. Now you should have both sides of the flag next to each other, thus forming a single two-sided flag. Once you are satisfied with the size of the flag, then print it out and cut it out like you would any other paper flag. Swab the backside with white glue and then fold the halves around your flag staff. While the glue is still wet, take old paint brush or pencil (something round) and curl the flag around it to create furls and bends in the flag. (see example below). Someone once told me that flags flap in the breeze in a diagonal pattern to the flag staff. So never have your flags furled perpendicular to the flag staff. The Kronoskaf flags will look to shiny and ordinary and without any depth, shadows or highlights. So my next step is to customize the flags by painting over them with acrylic paint. If you want to keep it simple, using the existing color as your highlight for a white flag, or your shadow for a dark colored regimental flag. In the colonel's white flag below, I painted over the surface with white paint and then added shading by using a light grey color. This gives you instant depth and dimension and looks much better than using the flag straight off your printer. For the red regimental flag I used the printer red as my shade color and added lighter reds to achieve the highlights that you see in the photos. Front view of the Kronoskaf flags after some paint embellishment. Rear view of the customized Kronoskaf flags. I decided to take the alterations another step further and add shading and highlights to the decorations that are on the flag. So the sun rays were over painted with a dark yellow and then the sun rays were painted back onto the flag with a brighter yellow paint. The black double-headed eagle received a middle coloring of black mixed with some flesh colored paint = painting the wings in this new color. I decided that the first highlight of black was not distinctive enough, so I mixed up a new highlight color using the black/flesh combination and then adding a small bit of white paint to the mix. This new color is light enough that one can paint lines on the eagle's wings to give the impression of feathers. You can touch up some or all of the decorations in the flag to whatever level you fancy. The two flags above had everything repainted except for the red heraldric shield on the breast of the eagle. By the time you are finished with all of this, it almost looks like you have a hand-painted flag. 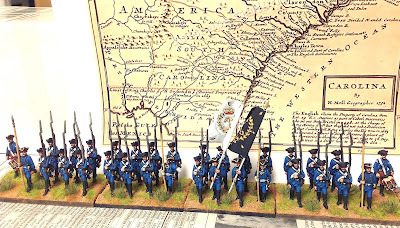 My freehand painting of flags is very ordinary to average, but having the actual design on the flag as your guide, you can create what is basically a custom painted flag for your unit. By the way, I did all of the paint customization once the flags were glued onto the flag pole. 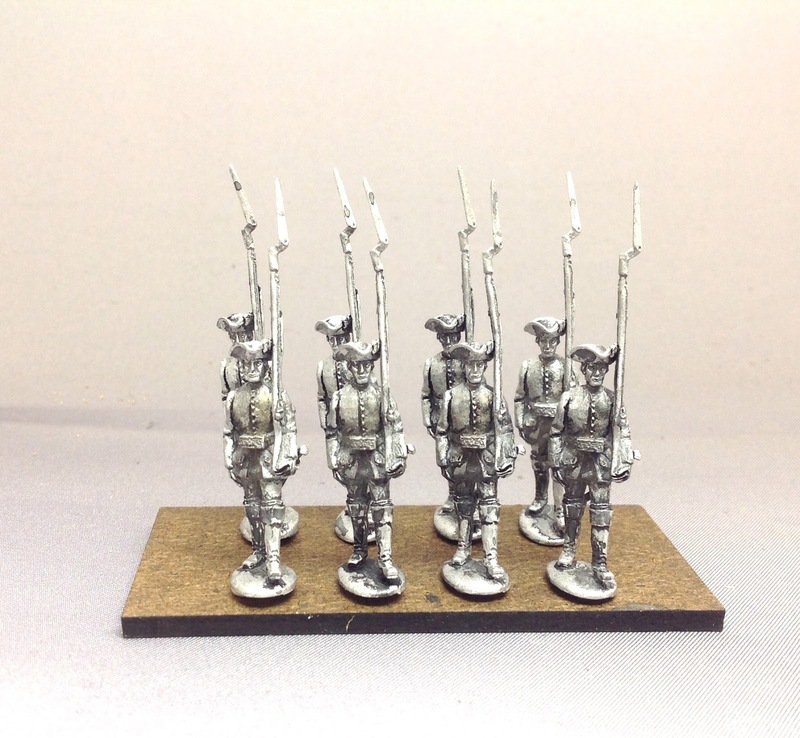 New Minden Russian Observation Corps Grenadiers. I have finished painting the two packs of the new Minden Miniatures SYW Russian Observation Corps Grenadiers: MR-015 Grenadier Command Pack (5 figures) and MR-016 Grenadier Pack (8 figures). Obviously the pictures of painted figures give a better indication of how the figures look as compared to pictures of black washed figures. I plan to use these figures in a 32-figure grenadier regiment. After that, I will paint some sample Observation Corps Musketeers. I found the notebook that I carried with me when I was visiting Frederician battlefields in October 2016 with Christopher Duffy and a group of 20 other battlefield trekkers. I thought that some of my readers would find my notes of small interest, given that they are my own first hand account, if you will. The source of Russian resentment towards Frederick II and Prussia lie in two things; first that Frederick had penned a number of "rude poems" about the Empress Elizabeth of Russia, which earned him the ire of the Russian Tsarina; and second that Elizabeth recognized the threat that Prussian aggrandisement would pose to Russia in the future. The Russian army had not fought a modern European army in a number of years. Its familiarity was more with how to fight against the Turks. The Russians adopted clumsy tactical formations, particularly the large "army square" that was protected on all sides - front, flanks and rear - against an enemy attack. The long supply tail that the Russians had to endure. Since they lacked forward bases close to Prussia, the Russian army had to begin every campaign in Russia or eastern Poland and move men, material and supplies hundreds of miles towards the theater of war astride the Oder River. As a result, it took the Russians a long time to wind up their war machine at the start of the campaign year and it usually did not come into contact with the Russians until late Summer, thereby shortening the campaign season and giving them a small window to win the campaign. Given all of the above considerations, it really took the Russians two campaigning seasons to move up the learning curve with respect to fighting a war with the Prussians. 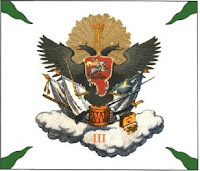 Thus by 1759 (the third campaign of the war), the Russians were finally able to solve many of the problems that had hindered their performance over the first two years of the war. By the start of the 1759 campaign, the Russian military had become familiar with the tactics of Frederick the Great and they had begun to fashion effective counter-measures to the Oblique Order system of attack. General Willum Fermor (leader of the army at Zorndorf) had written a training manual for the Russian army, one that recognized that they could not expect to out maneuver the Prussians prior to the start of the battle. Russian counter-measures to Frederick's tactics built on their familiarity and strong suit in being able to quickly construct field works. So rather than out march the Prussians, they would dig in and wait for the inevitable Prussian attack on their flank or rear. Artillery batteries were now sited at key points to break up the Prussian attack as it developed. The use of the Shuvulov (Secret Howitzer) Howitzer provided the Russians with effective short range infantry support that could offset the Prussian prowess in musketry. Starting in 1759, the Russians now deployed in formations of depth with adequate reserves that were ready to move to where the attack was developing. Logistics: the Russian quartermasters were now required to carry out orderly requistions of supplies from the local civilian populace, including payment for the requisitioned supplies. Forward supply depots were now set up in Poland (Thorn and Posen) as well as in East Prussia, which significantly shortened the supply tail of the Russian army, moving the supplies and the starting point of the campaign ever closer to the Prussian homeland. The Russians broke their army down into smaller, self-sufficient columns that were more flexible instead of marching towards the Oder River in one large column of march. More capable leaders were rising to the top of the Russian army by 1759 - its commander, Saltykov, was a very reliable general that got along very well with the Austrians, and more importantly, he got along well with his own generals. During the 1758 Zorndorf campaign, the Russian army commander, Fermor, did not get along very well with his own generals. Frederick marched north of Kustrin to find a place to cross the Oder River and interpose his army between Fermor's main army and the detached corps of Rumynatsev down river at Schwedt. Thus neither segment of the Russian army were in a position to help the other. Frederick does a reconnaissance of the Russian position near Zicher and decides on his usual tactic of marching around the flank of the Russian army. He had an opportunity to destroy the Russian baggage train ("wagonburg") at Kamien and had he done so then the Russians would have had to retire back into Poland without so much as a fight. Frederick had no experience fighting the Russians and so he had no idea what it was like to fight them - in hindsight, Frederick might have done things different and focused on cutting off the Russian lines of supply and communications. Frederick decides to attack the Russians with his left wing and refuse his right wing. 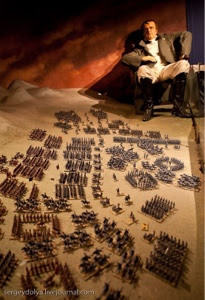 He thought that he was attacking the rear of the Russian position, but the Russian army was used to being attacked from any direction as a result of having fought the Turks in the past. So it was an easy matter for Fermor to turn his army around and face the new line of attack of the Prussians. The battle commences with the attack of Manteuffel's Advance Guard on the Russian right wing. Kanitz was to support this attack with his left wing, while Dohna's right wing became the refused wing of the army. Things quickly go astray as Kanitz's troops veer off towards the right and away from Manteuffel and the battle devolves into a frontal assault much like at Kolin. 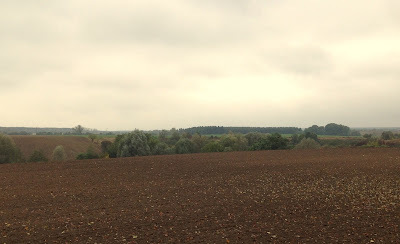 Zorndorf - the site where Manteuffel's Advance Guard attacked. What made the Russian soldier such a stalwart fighter? the peasant stock of the common soldier made them readily adaptable to militiary discipline. because they were used to being beaten. peasant structure - help each other, self-sufficient characteristics. Seydlitz's cavalry wing is deployed on the Prussian left. He waits until he senses a weakness in the Russian line and then feeds his horses across the Zabern-Grund in small groups. Dohna commits the refused right wing of the Prussian army and the battle now becomes a general battle that proves to be bloody and indecisive. Fermor withdraws towards his supply routes and thus the campaign of 1758 is effectively over. Duffy mentions that the East Prussian regiments in the army were no good for the remainder of the war because they had been through a most horrible battle. 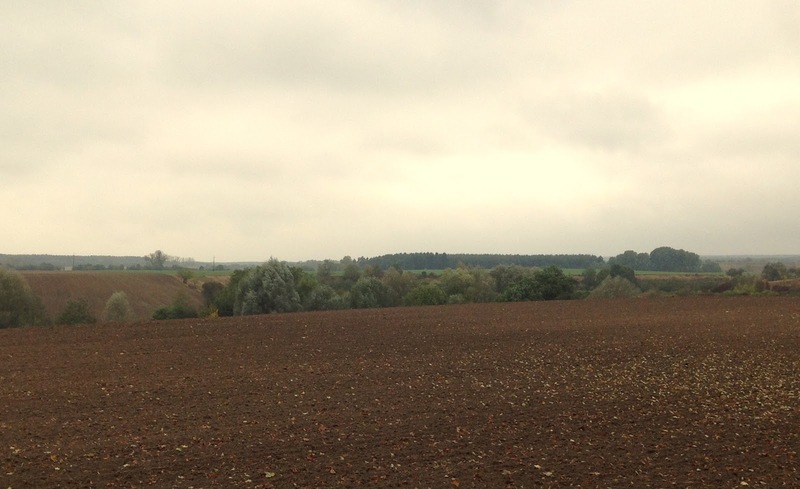 Since this post is getting rather long, I will continue my Kunersdorf notes and information about Kunersdorf battlefield archeology in my next post. My Pomeranian Army, so far. 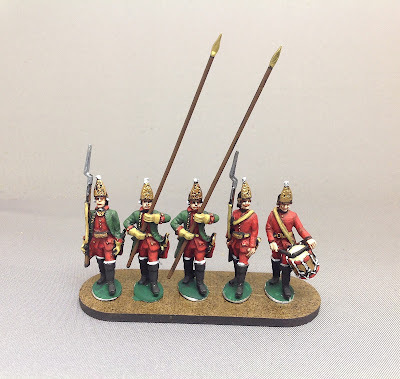 Four of the 15 battalions have been painted. For the rest of 2018, I plan on working on a new wargame project that is centered around the battle of Kunersdorf in 1759. The goal is to have the game ready for the 2019 SYW Association Convention at the end of March 2019. The Kunersdorf Project (there, it is official now that it has a name) will require the building of a Prussian Pomeranian theater army and adding the Russian Observation Corps to my existing Russian army. 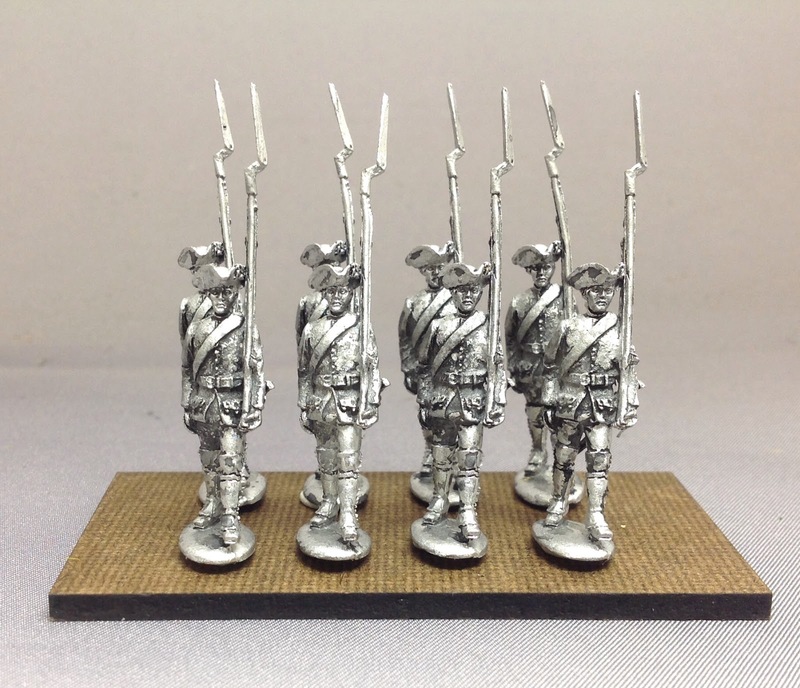 Fortunately, Minden Miniatures has recently added the Observation Corps musketeers and grenadiers to its range of SYW Russians, so I have the correct figures to use for that part of the project. The Prussians, on the otherhand, require a bit of an overhaul in order to field an army that is appropriate for the battles of Paltzig and Kunersdorf in 1759. The same army could also be used for Zieten's raid into Poland in 1760 and Platen's raid into Poland in 1761. 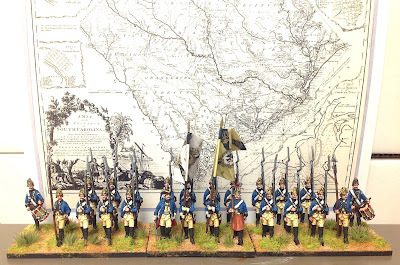 This will be an entirely new army of Minden figures consisting of regiments that fought in the Kunersdorf campaign. It will allow me to use my new basing system of 32 figures for the Prussians. My existing Prussian army of 30-figure battalions will continue to fight the Austrians in Silesia. However, going forward, all new regiments of infantry will be based in the new manner. I can't pry the old figures off of their wood bases because I used cyanoacrylate (Super Glue/Krazy Glue) glue and metal to glue bonds just don't separate. Front to back: IR46 von Bulow, next two battalions are IR35 Prinz Heinrich, GAR V Jung Sydow. In general, the infantry will be divided into three brigades of 5 battalions each. 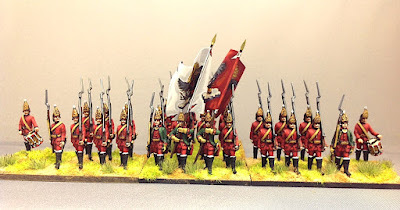 I do not have to change the basing for my Prussian cavalry (2 per stand and 6 stands per squadron) so there is no additional work involved in the cavalry component of the Pomeranian army. 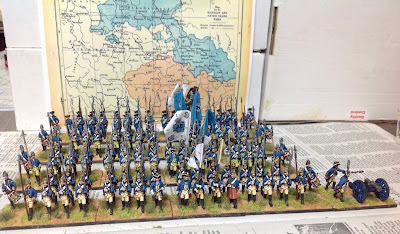 I already have 12 battalions of Russians that I used in my Zorndorf game this year, so I am in fairly good shape with respect to the Russians I need for Paltzig and Kunersdorf. I need to paint at least four Observation Corps battalions, 3 Musketeers and 1 Grenadier. I will follow up in a future post about the new basing system that I am using for the Russians and Prussians. So stay tuned for later this week. I was doing a search for some maps of Silesia, circa the 18th Century, to use as the basis for a campaign map of this theater of war. I thought that my readers would enjoy looking at them and considering how they might use these maps for their own purposes. The map at the top of the page, circa 1561, is particularly colorful. Breslau and the Oder River are at the bottom of the map and Bohemia, trans mountains in white, is at the top of the map. This is kind of backwards from how we normally view such maps. The second map is a really good one of Silesia, but alas, I could not make it very large and it is a bit out of focus, making it difficult to read. The third map, below, is one that I intend to use as a photo background for when I take pictures of newly painted battalions for my Prussian armies. It can be printed either in color, as a sepia or in black and white. The sepia version has a good "old" look to it. You can download the map and play around with the coloring in your picture application (iPhotos if you have a Mac computer). Theater Map of the Seven Years War showing the main domains of Brandenburg, Silesia, and Bohemia. This map makes for a good background for photographs of units, especially if printed in black and white. I have always been intrigued with maps and enjoy looking at them and analyzing them in greater detail. I will be posting more maps in the future. I'm looking for a good local map of the Kunersdorf-Paltzig area and one of Poland around the town of Posen. The latter map will provide some context for a raid into Poland to destroy Russian magazines at Posen. 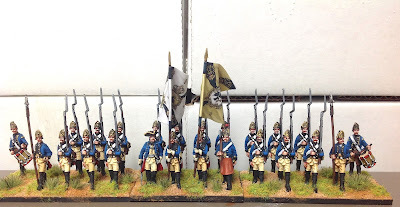 The first battalion of IR46 von Bulow went into service in my Pomeranian Army yesterday. The actual painting was completed two days ago, but battalions and cavalry regiments do not enter service until they are flagged and based with terrain, tufts and static grass. The first picture, above, depicts the new basing and organization system that I am using for my Russians and Prussian Pomeranian Corps. 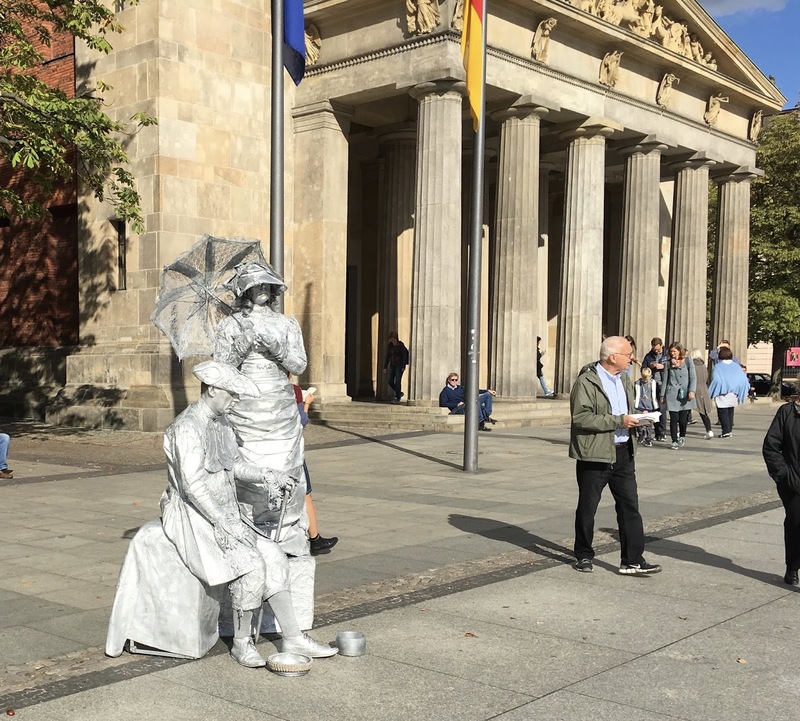 The figures are now on four stands with 32 figures instead of five stands and 30 figures and they are placed closer together. I am now going to add a stand of regimental guns with each battalion. The 3-pounder fires as a cannon at long range, but once it comes within musket range, the stand adds a single D10 die to the musket firing. After one stand of infantry is removed from casualties, then the battalion gun is also removed from the table. The von Bulow fusilier regiment fought at Zorndorf and it was made rather famous in the 19th Century through the Carl Rochling painting of Frederick II grabbing the regiment's flag and trying to personally lead the regiment into an attack against the Russians at Zorndorf. Frederick the Great leads the von Bulow regiment against the Russians at Zorndorf. The regiment was initially stationed in Far Pomerania, but the first battalion fought at Prague in the King's army, and then was transferred to the Duk of Bevern's army at Breslau, where it took part in the loss outside of Breslau. It rejoined the King's Army in time to participate in Leuthen. In 1758, the regiment participated in the sieges of Schweidnitz and Olmutz and then had the misfortune to be at Domstadtl, where it escorted the massive supply train that was captured by the Austrians. It joined Dohna's army at Frankfort on the Oder and fought at Zorndorf. It was attacked in the flank at Zorndorf and Frederick tried to rally the regiment by grabbing its flag and attempting to lead them forward. Frederick held the regiment in good regard. In 1759, the regiment was attached to Prince Henry's army in Saxony, but then was sent to Kunersdorf, where it suffered in the attack on the Gross Spitzberg. In 1760, the regiment had the misfortune of being in Fouque's Corps at Landshut and fought "with the greatest of bravery" before being virtually wiped out through casualties and prisoners. Thereafter, the reconstituted regiment remained out of the main theaters of war, being stationed at Breslau from 1761-1763. It was a hard fighting regiment, but an unlucky one. Same as the previous picture, but with a background added. 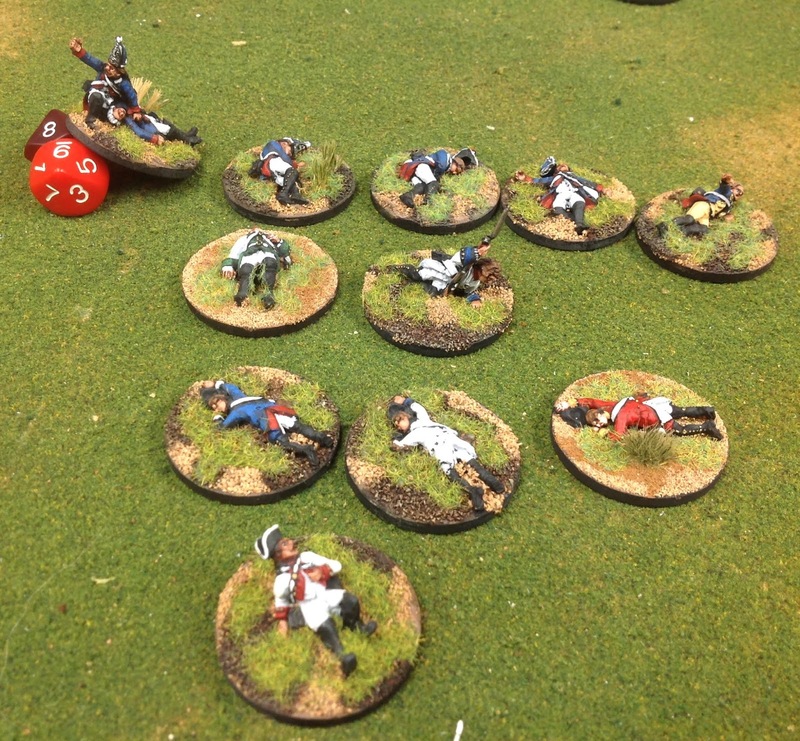 I now have four battalions of Prussians painted under the new organization in my Pomeranian Corps. 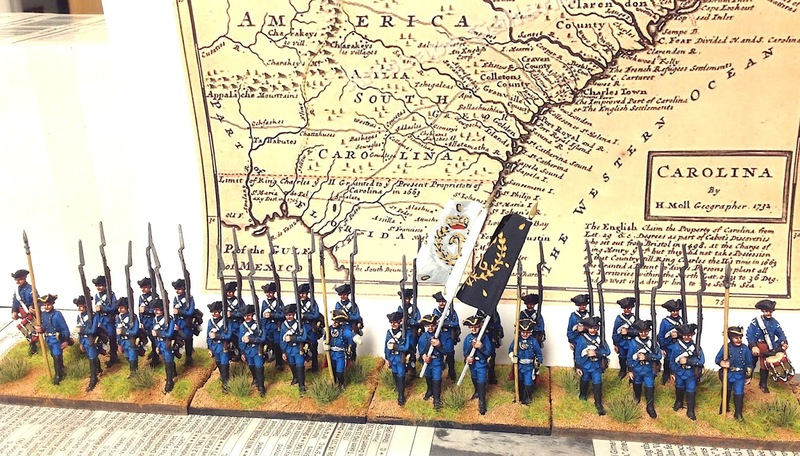 The figures are Minden Miniatures, of course, and the flags are made by GMB Designs. 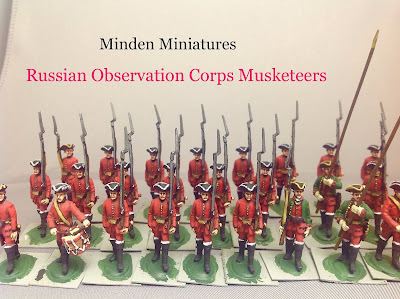 The new Minden SYW Russian Observation Corps ("OC") figures arrived from Griffin Moulds yesterday. The figures include OC musketeers and grenadiers, both in their summer kit of sleeved waistcoats. The officers wear the regulation coat. Both groups of figures have a command pack of 5 figures and a rank & file pack of 8 soldiers. 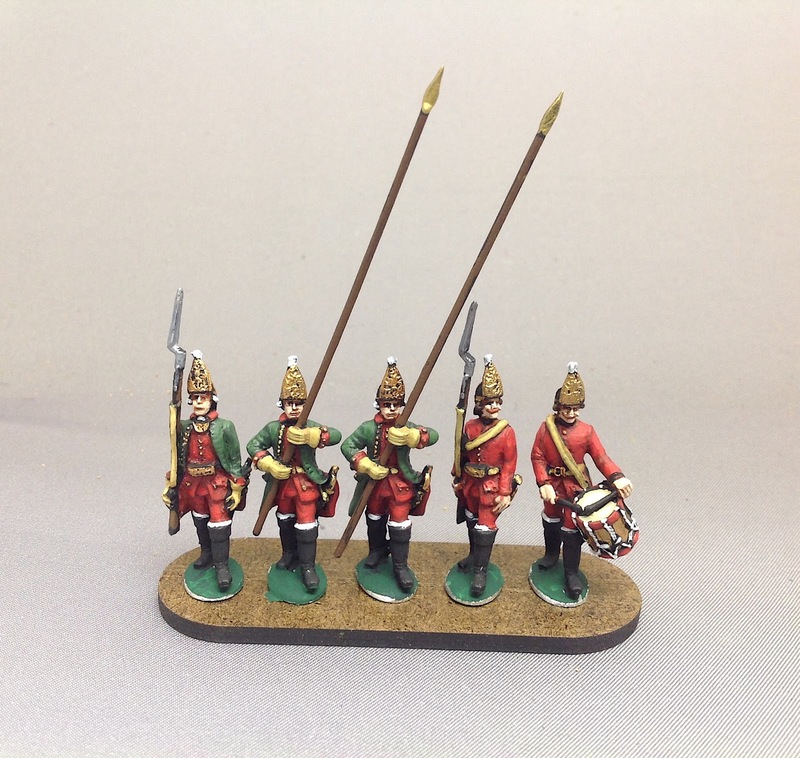 There will also be packs of two extra standard bearers for both musketeers and grenadiers. The Observation Corps figure packs are being offered at $10.00 for the command packs, $4.00 for the spare standard bearer packs, and $16.00 for the pack of rank and file soldiers. The Observation Corps figures will be priced at the old Minden prices for a limited time, through June 30, 2018, afterwhich they will be sold at the regular Minden prices. 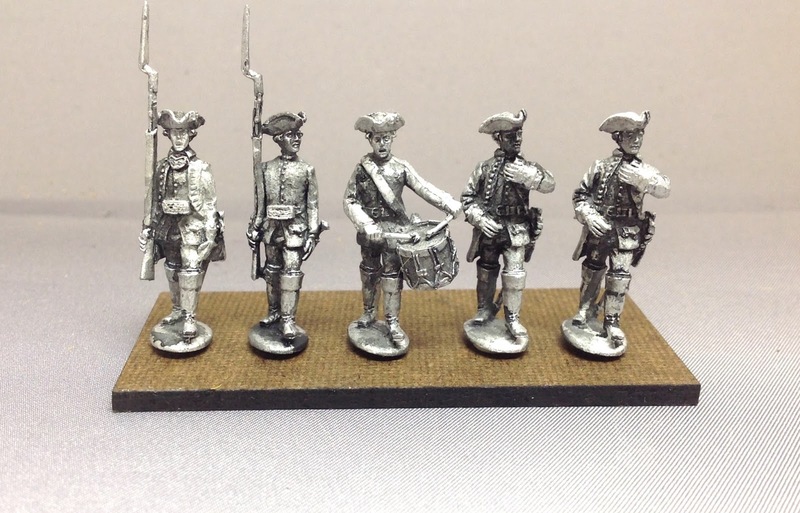 The new figure packs are now added to the Fife & Drum Miniatures web store. 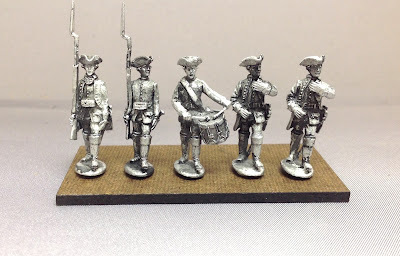 Click on the link HERE to go to the Fife & Drum Miniatures web store to inspect and purchase figures from our new SYW Russian range of figures. Observation Corps Musketeer Command (MR-013) pack with five figures. Observation Corps Musketeers (MR-014) pack with eight figures. Observation Corps Grenadier Command (MR-015) pack with 5 figures. Observation Corps Grenadiers (MR-016) pack with eight figures. Regular Line Musketeers in Summer kit (MR-005b) pack of eight figures. A gamer and a terrier, Jean Francois. 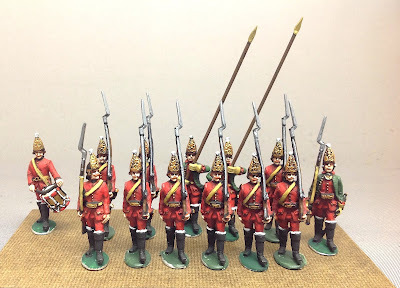 Yesterday I finished basing the second battalion of IR35 Prinz Heinrich fusiliers and so I now have a full regiment of two battalions, each having 32 figures. I had completed the first battalion about a year ago and half of the second battalion, but the Zorndorf Project grabbed all of my time. With the SYWA convention over, I have more time to free kreigspeil through the painting queue and paint whatever strikes my fancy. So I thought that it was high time to complete the second battalion with the 16 additional figures. All of my wargame regiments have two battalions. 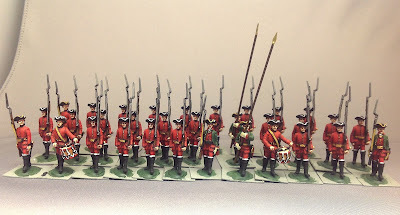 All of my SYW Minden regiments have two battalions. My existing units have 30 figures per battalion on 5 stands, but the new units have been increased to 32 figures based on 4 stands. 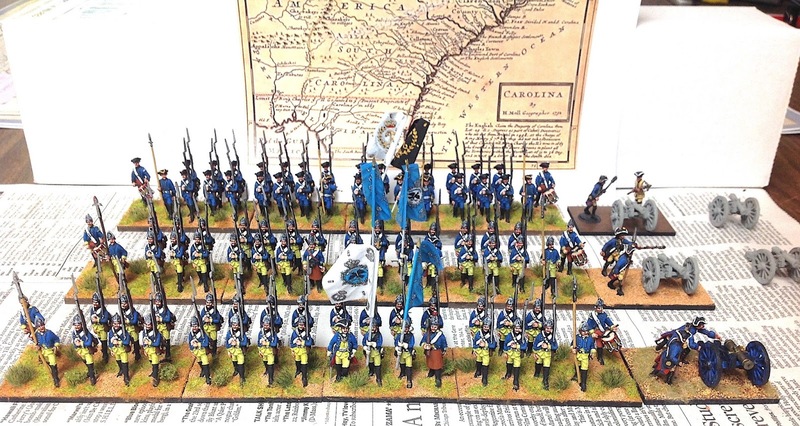 The change was made in order to move the figures a little closer together and also to place the drummer on each flank of the battalion, offset a little bit from the rest of the battalion. Prinz Heinrich regiment with its battalion guns - 3pdrs. Each battalion will have two center stands (60mm x 40mm) of 8 figures and two end stands (80mm x 40mm) also of 8 figures. However, the end stands are wider so that I can position the drummer in an offset position from the rest of the stand. This is done to conform to the Prussian drill manual in which the drummers are posted on the end of each flank. I am thinking that four stands looks a little unbalanced from a visual standpoint. So I am toying with the idea of adding a battalion gun - 3-pounder - stand that will be placed on one of the battalion flanks. The cannon will be allowed to fire as a cannon from long range, but when the battalion draws into musket range, the cannon will no longer function as a cannon. Instead, it will add one more D10 die to the dice used for firing in my rules. (there is one D10 for every four figures in the battalion). 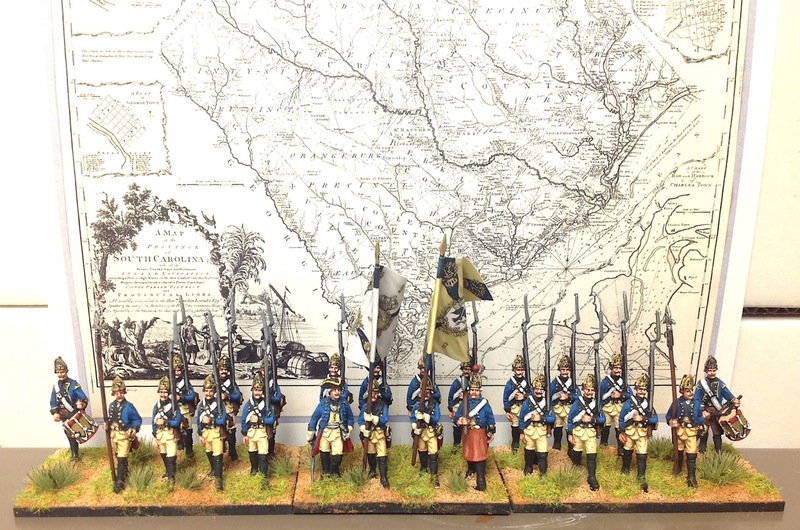 The regiments/battalions in the new basing scheme will become part of my new Pomeranian Project, that is, a lower quality army than the King's army, and designed to fight the Russians on the Oder River front. The Garrison V Regiment, Jung Sydow, fought at Paltzig and Kunersdorf, making it a rather unlucky regiment, one might think. The regiment's pictures were posted in the previous posting on my blog, but for some reason, it didn't get any love from my blog readers noting that it received one of the lowest number of visitor hits of any recent blog posts. 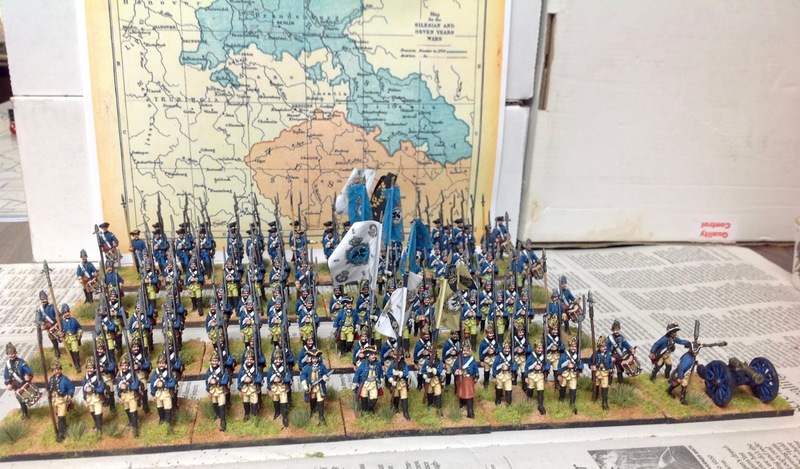 I am not sure why this is, so here is another view of the first battalion, including the hand-painted flags that I had to make since GMB Designs does not make flags for the Garrison regiments. 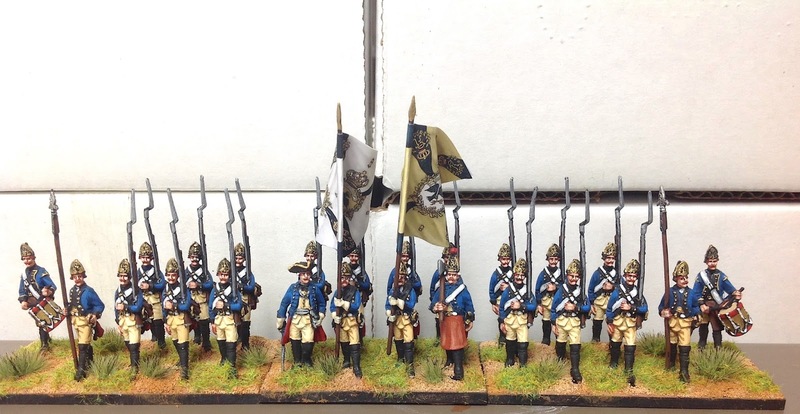 Jung Sydow will eventually get a second battalion painted, but not for now. to lead them forward during the Battle of Zorndorf. Frederick tried the old "grab the colours to inspire the troops" gambit at Kolin and Zorndorf. In each case, the regiments involved took a powder and Fritz found himself leading the advance all by himself. So it's back to the painting table to finish the first battalion of IR46. This will give me 4 battalions in my Pomerian Prussian army, which is starting to have enough mass to look like a brigade, if not a small army. I don't have to paint any cavalry because I am keeping the same basing system for them: 2-inch square stands with two horses and riders per stand.